Following the smash success of Contemporary Monologues for Young Actors, award-winning NYC playwright Douglas M. Parker has created a new volume of unique monologues that allows young actors to explore a broad range of characters, emotions and situations. 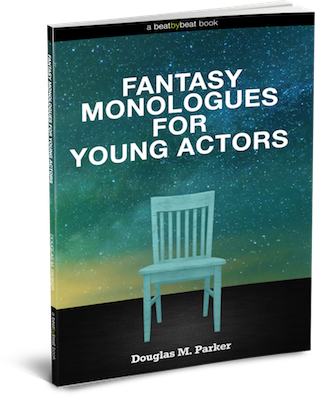 Fantasy Monologues for Young Actors offers 52 fun, accessible and inventive monologues that will tap into every inch of an actor’s creativity. Featuring appealing, instantly involving pieces ranging from the comedic to the heartfelt, every monologue is written in contemporary and accessible language. Created specifically for actors and acting students ages 7-14 and for the teachers, directors and acting coaches who work with them. A broad range of unique circumstances and emotions: comedic, inspirational, heartfelt, lonely, curious, etc. Here are a few sample monologues from the book. At Beat by Beat, we’re passionate about raising the bar on the quality of resources that are available for young actors…and you’ll find this book to be no exception. Over 45,000 people a month visit the Beat by Beat website, discovering tools and resources which have brought joy to teachers and creativity to young actors around the world. You have our personal guarantee that if you aren’t completely satisfied, if you don’t love this monologue book and use it all the time, call or email us within 30 days and we’ll refund every penny immediately. Check out the inside of the eBook – Click here for a PDF preview.